23-Aug-2002 -- The Blossoms and Greens are fourth generation families in Door County, Wisconsin. Upon hearing of the Degree Confluence Project, the third generation men, who are seasoned (and a bit dog eared) sailors decided to hunt a degree confluence down and kill it. Their much younger and better looking wives were somewhat skeptical of this venture, as the only available confluence lay some forty five miles away in Lake Michigan under 175 feet of water. Undaunted, the explorers set out at 10:35 a.m. CDT on August 23, 2002 in the motor vessel Old Sailor's Home, a 36 foot 1964 Chris Craft which has been painstakingly (and expensively) restored by John Blossom, Jr., who was to captain the expedition. The forecasted calm seas and 75 degree temperature promised ideal conditions. 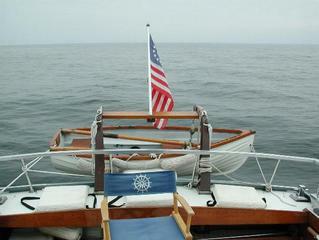 Aboard were John R. Green, Jr., his wife Norma, and Linda Blossom, First Mate. Despite threatening clouds in the east, they made their way up the west coast of Door County, which is a glacier peninsula jutting into Lake Michigan north of Green Bay. Proceeding through Port de Morte (Death's Door), the Confluence Project Ship passed from the waters of Green Bay into Lake Michigan, raising Northport Ferry Dock at 11:20 a.m.
Just as it was entering the shoal infested northeastern shoreline of Door County, the ship's GPS system failed. Concerned that the "Confluence Project Gremlin" was at work, the crew were relieved when the nexessary repairs were made with an engineering hammer, and the adventure continued. Cana Island Lighthouse was abeam to starboard shortly after noon, and the Old Sailor's Home plunged into the heart of Lake Michigan on a southeasterly course. Amid growing excitment, the crew approached their destination about an hour later. Those who have made a confluence on land may have had some troubles with giant ant hills and jungles, but they KNOW when they have arrived. Approaching a confluence on a moving ship in rolling seas is a different story, particuraly when one wants a photograph of the GPS fix to prove he has arrived. After chasing his wake like a dog for three or four circles, Captain Blossom finally nailed the destiation at 1:05 p.m.CDT. Amid kisses and cheers, a memorial rock marking the confluence was sunk in 173.9 feet of water. An adequate bottle of champagne was consumed in silver chalices, and several cans of Guinness were doffed to honor Linda's roots. Green and Blossom, being Scotch and English, mourned that they had not thought to bring a Pims Cup, but were pleased that Norma the Swede had forgotten her glogg and lutefisk. The ladies jumped ship in Bailey's Harbor, and the two men were left with the boring voyage home (although there was a dram of champagne left, which helped). They arrived in port at 5:35 p.m. after one of the more interesting days of the summer and securing a place in history. In Lake Michigan, with a view of land visible on a clear day.